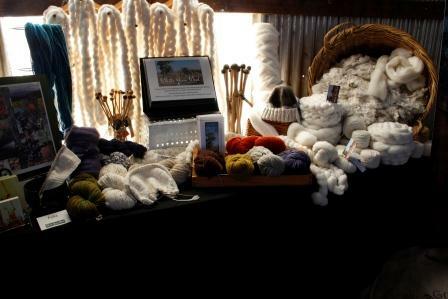 .......I packed up the White Gum Wool stock, Tilly Ewe and the market paraphenalia and Nan, The Shearer and I made the trip to Tassie's premier Sheep and Wool Show - Campbell Town - Friday 1st and Saturday 2nd June. With much appreciated help from Sue, Biz and a visit from Wendy and Sten, we were able to tell visitors to our stand about the joys of the new White Gum Wool range. 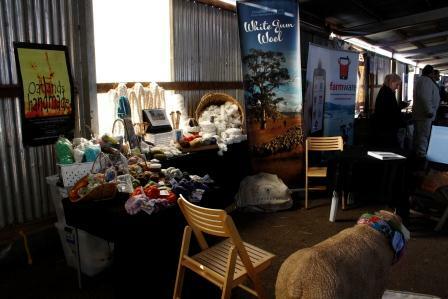 We had a prime spot in the Main Pavillion opposite the superfine merinos and within sight of the fleece displays and the catwalk. Bayer on one side and the innovative McShanes with their Farmware app on the other! As well as the WGW gorgeous natural wool top and samples of the scrumptious yarns we will have available, it was the first outing for the new colour pallette designed for WGW by Wendy Koolhof. These stunning hues were developed with the Midlands Landscape as inspiration and are available as 100g packs of hand-dyed top right now and will be echoed in our new knitting yarn range (available hopefully by end July). I was gobsmacked too when the Fashion Parade started - there were our colours echoed in the "on trend" colours for the season....thanks Wendy! Well, the hectic activity was worth it! We had a great time, and gues what? 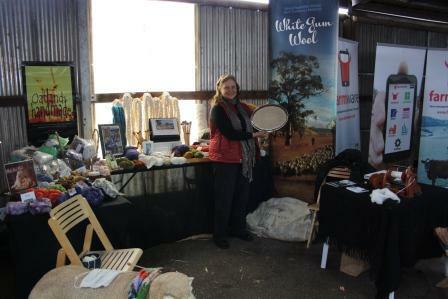 WGW took out the Midlad Ag Association ANZ Bank Perpetual Trophy for the Best Trade Exhibit !!! An excited Nan holding the Silver Salver! A great job Nan too! 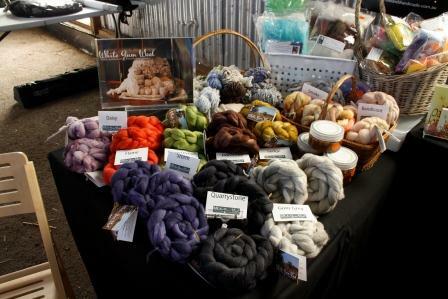 third in the "Group of Three" Superfine Merino Fleeces. Well done to Nan and White Gum Wool. For weeks now, the WGW Team has been working feverishly to have our garments ready for the Australian Wool Innovation Fashion Parades at the Show. Designer/Felters Sue Evans (Launceston) and Svenja (Queensland) and weaver moi ( Rowena) at Oatlands Handmade have been working with WGW Fibre to create a small collection of original garments. We were stunned by the reception to our results - the comments at the Parades was very very encouraging and we have been invited back next year! Our thanks must go also to Robyn Quill of Laincot at Ross whose stylish, comfortable and unique jeans partnered several of the outfits.